An introduction to the applications you'll use along your academic journey at CR. Already familiar with the basics? Use the navigation links to the left to jump to a specific area. Your Student ID Number is also known as your "7-digit College ID". 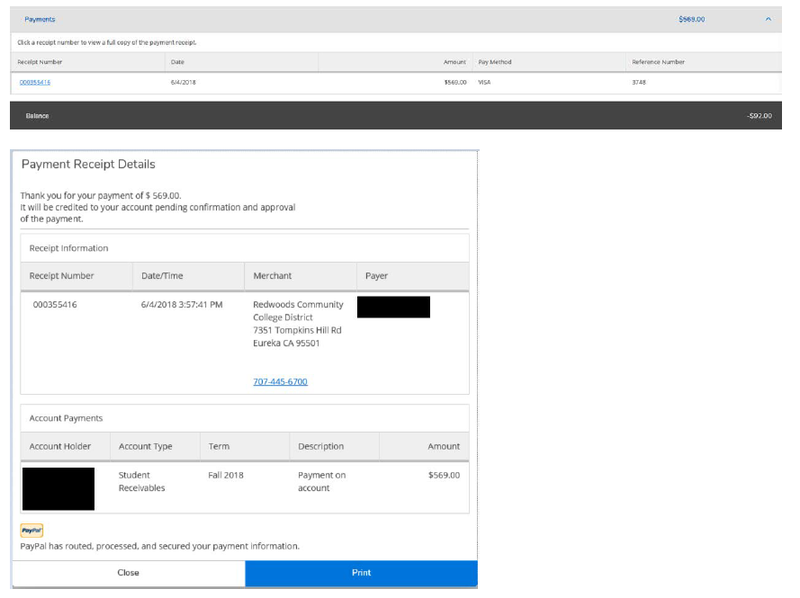 You'll find your student ID number included in the email sent to you when your application for admission to College of the Redwoods has been reviewed and accepted. It doesn't contain any letters. Keep this number private and do your best to memorize it. You'll need to provide this number whenever you take advantage of the many services available at the College. If you can't find your Student ID number, contact Enrollment Services at (707) 476-4200. You'll use your User ID to login to your student accounts. Your User ID is the first letter of your first name, your full last name, and last three digits of your Student ID number. For example, let's look at a student named "Bugs Bunny", with a student ID number of "0123456". Note that the letters in your User ID are all lowercase. If you try to use capital letters in your user ID when you sign in, some systems at the college might not recognize you and will not allow you to sign in! Your password will be different for each of your student accounts. Click each tab below to view the default password for each account. Your Student Email password will be your 8-digit birthdate, in MMDDYYYY format (just the numbers). Keep in mind that resetting your password for your Student Email won't have any impact on your other student accounts. You'll need to reset those passwords separately if need be. Your Canvas password will be your 8-digit birthdate, in MMDDYYYY format (just the numbers). Keep in mind that resetting your password for your Canvas account won't have any impact on your other student accounts. You'll need to reset those passwords separately if need be. Your WebAdvisor password will be your 6-digit birthdate, in MMDDYY format (just the numbers). When you first log in, WebAdvisor will display text telling you that the password has expired and it will have you change it to something else before you can go any further. Keep in mind that resetting your password for WebAdvisor won't have any impact on your other student accounts. You'll need to reset those passwords separately if need be. Your student email address will be your User ID, followed by "@mycr.redwoods.edu". We'll send all communications to you via your student email address. Your student email uses Google Services and it is created for you after your application for admission to College of the Redwoods has been reviewed and accepted. From the College of the Redwoods Homepage, click WebAdvisor, then click "Log In". Use your User ID and your WebAdvisor Password to login. From the College of the Redwoods Homepage, click Student Email. Use your User ID and your Student Email Password to login. Note that the "@mycr.redwoods.edu" part of your email address is already listed by default, so you only need to type in the User ID part of your email address. From the College of the Redwoods Homepage, click Canvas. Use your User ID and your Canvas Password to login. Use this option if you would like to look for classes, add them to your preferred list of classes, and then register for them. Log into WebAdvisor and then click the "Students" button. Under the Registration section, click "Register for Classes". From the "Search and Register for Classes" page, select a Term, and narrow your search further by including a Campus or Subject(s), or both. A course number is not needed, but you'll need to include at least a term and one other limiting criteria such as "Campus" or "Subject". Once you're finished, click the submit button and the "Section Selection Results" page will be displayed. Select the course(s) you want to register for by marking the checkbox to the left of the course, then click the submit button at the bottom of the page. After you click submit, you'll be taken to the "Register For or Drop Previously Selected Classes" page. From here, use the "Action" dropdown next to the course(s) in your Preferred Sections and select "Register". Scroll down to acknowledge the Cal Grant award information by checking the checkbox, and then click the Submit button to register. From the "Express Registration" page, enter the 6-digit section number of the course you would like to enroll in, and select the appropriate term. Section numbers are tied to a particular campus. Please ensure the course you enroll in is on the campus you want to attend. Use this option if you have already placed sections on your preferred list and would like to now register. You'll be taken to the "Register For or Drop Previously Selected Classes" page. From here, use the "Action" dropdown next to the course(s) in your Preferred Sections and select "Register". You'll be taken to the "Register For or Drop Previously Selected Classes" page. From here, check the "Drop" checkbox next to the course(s) in your Current Registrations that you intend to drop. Scroll down to acknowledge the Cal Grant award information by checking the checkbox, and then click the Submit button to drop the selected classes. The following areas of WebAdvisor will be undergoing an upgrade January 3, 2019, this tutorial is designed to help you through this transition. The links identified below will direct you to a new site where those functions now live. After clicking one of the links identified above you’ll notice there is a ‘Menu’ bar located on the left hand side of the new site. At any time you can click the ‘Home’ button and you’ll be taken to the Welcome Page where you can navigate to any of the new areas. Grades – You can display and print grades as far back as Fall 2002. If you need grades for earlier years you can return to the ‘Student’ menu in WebAdvisor and print an Unofficial Transcript. We hope you find the new areas of WebAdvisor easier to use with a more modern interface!